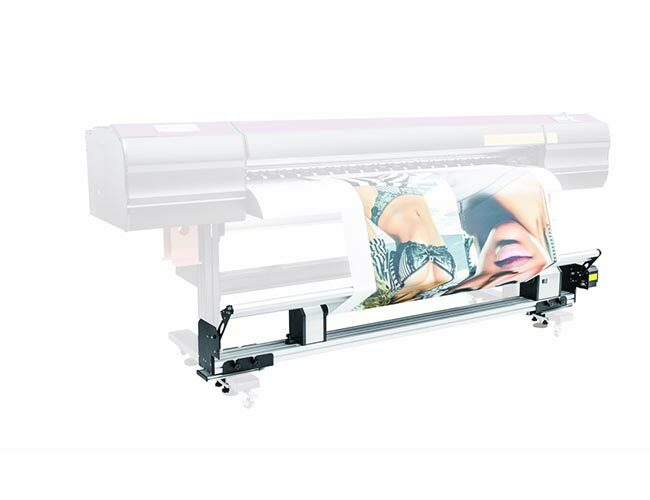 Automatic take up system T1, with inductive tension system, while the printing stop, the rolling stop also. Suit for heavy media rolling. Bearing weight ≤50KGS. Neat rolling, durable life. 1.With DC 24V adaptor changing input voltage 100-240V, widely used in most countries. 2.Plastic medium flange 2"(φ48-53mm) and 3"(φ75-80mm) are available for various paper core. 1. Q: What’s the working theory of take up system T1? A: Adopt the inductive tension structure to ensure the neat rolling. 2. Q:What kind of material can it roll up? A:PP, adhesive sticker, transfer paper, pictorial cloth, car sticker, wallpaper, leather, flag cloth, etc. 3. Q:What’s the bearing weight? A:≤50KG, suitable for heavy material. 4. Q:Can the take-up system T1 roll up soft film? A:Yes,it’s best to match the feeding system F3 together. Feeding and rolling are both important due to the specificity of film. 5. Q: What’s the working voltage? A:Working voltage: 24V; Input voltage: 100V-240V; Four plugs optional: Chinese standard, British standard, U.S. standard, E.U. standard. A:12 months, warranty components: circuit board, motor. 7. Q:What’s the consumable part? 8. Q: Is the speed of motor adjustable? A:No,inductive rewinding, synchronized with printer. 9. Q:Is your take-up system fit for our printers? A:universal linking slab, apply to any printer. 10.Q:Do you have CE certification? 11.Q:What’s the difference between T1 and other take-up systems? A:T1 adopts the inductive tension structure, synchronized with printer, and the winding force is balanced, without adjustment. K3, K5, and K8 are take-up systems with damper, sometimes it is necessary to adjust the damper to strength the torque. Refer to the comparative table. ADD: Room 2107, Fuyue Mansion, No.28 Zhonghuan West Road, Jiaxing, China.